Madoka Magica: Okay, so I’m watching this series episode by episode over on Crunchy Roll just to check it out after all the hype and fandom I see. Up to Episode 9, I thought it was a creative, dark take on Magical Girls. The twists were good, the animation was fantastic, and I was enjoying it–but nothing that I was too crazy over. Or rather, I didn’t mind waiting a few days after they released the episode to watch it, I should say. It was good, but nothing I was totally in love with. This is approximately 21:00 minutes into the episode. I literally shouted, "Yes! You are awesome and I love you!" This. Was. Amazing. I don’t want to spoil it–but this is how you do “Homura’s Power” right. This is the episode that validated & made the rest of the series amazing, made me fall in love with Homura, her relationship with Madoka in its entirety, and has me itching for the next few episodes. Love it. So good. Recorder and Randsell: I’d just like to stick in here that this show is still freakishly adorable and the episodes should be longer. Supergirl #8: New Artist! It threw me a little, but it wasn’t bad. Just a different style, but it all still looked good. Actually liking the Silver Banshee storyline. New girl Siobahn is fun and her & Kara were great interacting off each other. Seriously, people wanting awesome females in comics should be reading this. >.> It’s just been one great girl after another. Yes. Yes. Yes. 1000x Yes. 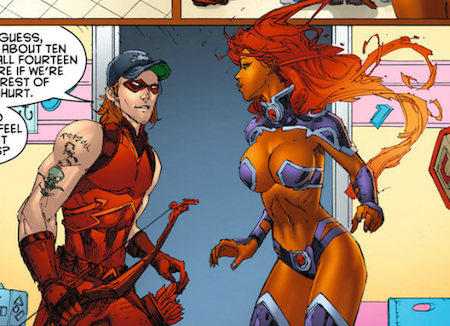 Red Hood and the Outlaws #8: This….has easily become my favorite issue of the series. 10/10 no question. It had everything. The Lorax: Loved this movie. Love the soundtrack more though: Ed Helms can sing and be hilarious at the same time. It’s an amazing combination. I didn’t think I’d like this movie, mostly because movies that push the ‘Go Green!’ thing tend to bug me, but hey! I liked Captain Planet, right? Anyway, the green-thing wasn’t nearly as in your face as I thought it might be, and giving The Once-ler some character and motivation worked very, very well. He also got the best musical number in the movie–“How Bad Can I Be” never really leaves your head. 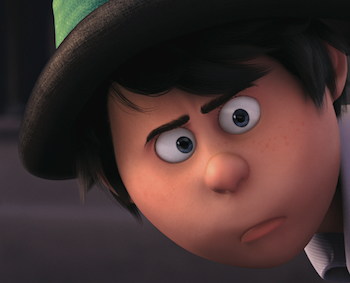 And Once-ler is amazing…because he’s adorable and I loved him. So much. I drew so much fanart of him and I really, really want the DVD to come out already so I can take screens of him in his suit and stare at them all day. *cough* But aside from being obsessed with The Once-ler, it was funny and Ted’s Mother made me laugh more than Betty White as Grandma Norma. This entry was posted in Anime & Manga, Comics, Fangirl, Movies, Music and tagged Batman, DC Comics, madoka magica, Nightwing, once-ler, red hood and the outlaws, Supergirl, the lorax, tim drake on April 20, 2012 by Liliy. This is by far my favorite cover...save for Dove vs Swan maybe. And Hawk & Dove #8 arrives. The final issue. Content wise, it ends the ‘Hunter’ arc, making it a solid two-parter. There’s not much to tell you other than that–it’s got some great action (can we say ‘ninjas’ and monster fight? :D) and a conclusion to the storyline. It felt a tad rushed (you can tell it was meant for more issues before the series was canceled), but both Hank & Dawn get some great last moments with the series. I don’t care what anyone says, I loved this series. I love the characters Hawk & Dove, and I’ll read anything that features them. But for this particular case, I think Gates & Liefeld did the characters justice throughout its 8 issue run. They both had their own take on the characters and each brought out something different with them. I wish the series would have been given more of a chance if only to bring some love to these characters who deserve more time in the spotlight, but sometimes things just don’t work out the way we’d like. Also, Dawn & Hank are adorable. 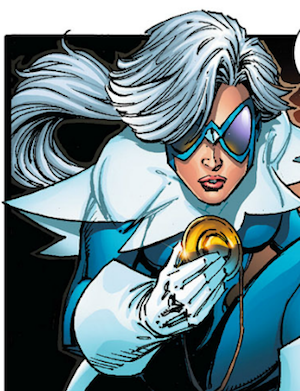 I plan to continue posting whenever I see Hawk & Dove popping up in the new 52. So, let me know if you spot them and I’ve missed them. This entry was posted in Comics and tagged DC Comics, Hawk and Dove, review on April 11, 2012 by Liliy. The second to last issue of the Hawk & Dove series (insert sobbing here), and another solo for Rob Liefeld writing & drawing. Also worth noting is the new colorist Andrew James Troy. This is the only frame that matters. And now that I’m finished drooling over Dawn from Page 1…let’s continue! Dawn’s gone crazy after the old break up with Deadman and starts partying it up at the local club scenes. Hank gets dragged along to be her wingman (Ha ha. I love puns, you don’t understand how much I do.) but more ends up her bodyguard when the guys get too fresh. He can’t take watching her like this anymore and drags Dawn out into the alley for a one-on-one intervention. They argue & have a cute little makeup session before…BAM! Interrupted by our new baddie: The Hunter. He’s out for our Bird-Themed heroes and thus ensues a great fight scene. The Hunter takes a couple souvenirs from our main duo (you have to read it…the one he takes from Hawk is particularly amusing) and the fight is held up by the appearance of newcomer Xyra, and the Hunter leaves. Turns out there’s a cult that worships hawks and that means Hank, our favorite Hawk, is on their ‘false god’ list. Hank & Dawn team up with Xyra for more information and Hunter retreats to the real big bad who has a bit of a prediction of things to come. Okay, this was the first issue where the art was weak in places. There may have been a cross eyed look here or there and some panels where the coloring seemed a little off with the inking. While most of the book looked great, it was just these few spots that looked slapped together. Good issue and I like where the story is going. I look forward to the last issue and I hope Hawk & Dove gets to go out with a real hitter. Definitely pick this one up if you can. It’s got some good stuff from Dawn & Hank bonding and seeing the stress in their relationship. This entry was posted in Comics and tagged Dawn, DC Comics, dove, hank, hawk, Hawk and Dove, review on March 12, 2012 by Liliy. 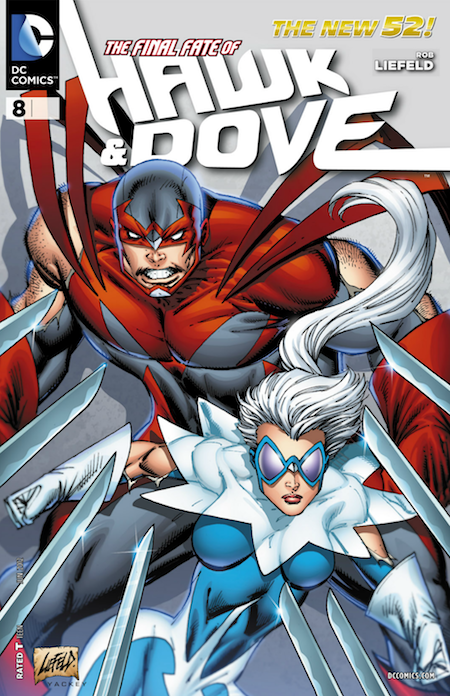 So, I’m a little behind with my review of Hawk & Dove–I was punishing myself with a ‘No Comics’ rule as I worked on things I had put off. Finally getting to read Hawk & Dove was my motivation to finish! 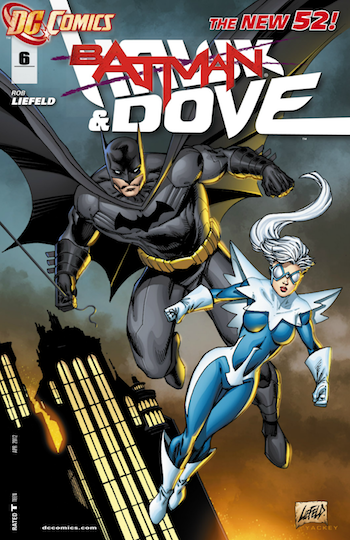 “Batman” & Dove #6, is the first issue with Rob Liefeld going solo with both writing & artwork (With Matt Lackey as the colorist~). Not only is this issue a crossover with Batman & Robin, but it’s also a self-contained one-shot. So, short & sweet–Actually, this is a great issue to jump in on if you wanted to get into the series. But I digress (Yes, I’m still very bitter Hawk & Dove was canceled when I love it so). He is a lot of fun. And how can you not love that grin? 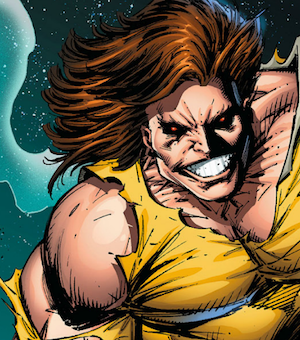 Our issue starts out with Hawk chasing down Blockbuster in Gotham. Blockbuster and Hawk duke it out on the building tops until Dove crashes the party–and she’s still in super-agressive mode from the last storyline. And of course, since this is a crossover (covers never lie, right? :D)–their chase down is interrupted when Robin takes out Hawk for stepping in on their turf. Hawk doesn’t take it well. 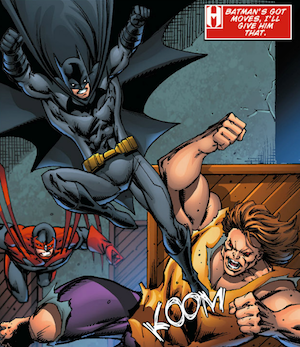 As it turns out, Blockbuster was working for a higher up Necromancer–who Batman and Robin were after–so they all team off to confront the big bad. There’s a big free for all for magic artifacts, and Blockbuster going wild, and all that fun stuff you get from an action scene. They take down the big bad, and part ways with Batman acknowledging that Hawk & Dove will be a formidable team in the future (if they survive each other long enough). Thoughts: I wasn’t sure what I was expecting coming into this issue, but I did like it. You can tell the difference in writing style between Gates & Liefeld almost immediately, and I can’t tell if that’s a good thing or a bad thing. But I was eating up the increase of puns in the text–but that’s me. Artwork wise, it’s continuing to step up issue to issue. Matt Yackey’s coloring is still a perfect match for Liefeld’s pencils & inks and it looks great. It’s bright and colorful without being blinding or too in your face. There were some great shots in this issue–and a spread of The four characters soaring over Gotham was amazing. Loved it! 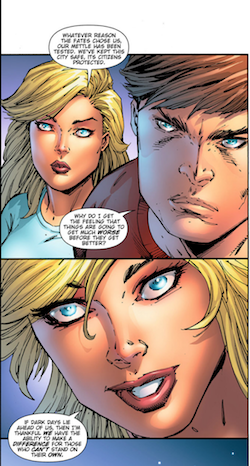 On Batman’s note, after seeing Hawk & Dove in the Birds of Prey series, I had to remind myself that this was probably the first time they’d seen each other…and it made sense it’d be antagonistic. Hawk & Dove don’t really do the ‘team’ thing outside of their own duo (as we can see how well the Deadman thing turned out–and even in Birds of Prey they sort of did their own thing), so the clash between the characters was a good match up. The only downfall to it all, was that I’m reminded yet again this series was canceled. There’s so much potential for these two in their solo series no matter who is writing them. But that won’t deter me from hanging in there to the end! We’ve got two more issues from Rob and I just know they’re going to be good. So check them out & let’s make sure this series goes out with some all time high sales! This entry was posted in Comics and tagged Batman, blockbuster, DC Comics, Hawk and Dove, review, robin on February 8, 2012 by Liliy. It’s the 5 episode mini-series packaged together as a movie and It. Is. Awesome. Seriously, I loved this thing. It was everything I loved about Transformers G1 and Animated mixed together. This series gets way too much hate from the Pony crowd. It’s good–really, really good. Plus, the voice acting is superb. Cullen is back as Prime, and Welker as Megatron. That can’t go wrong no matter how you shake it. The star player so far? Steve Blum as Starscream. That’s right–Roger Smith aka Spike Spiegal aka Kazuma in S-CRY-D as Star-freaking-scream. I had to see it to believe it. And man does it work. Anyway. Love it, and I can’t wait to get my season 1 box set so I can drool over Knock Out and Breakdown, too. The 1980’s series first five comics & the 2011 reboot are both on Comixlogy for $1.99 an issue!! …at the very least maybe Comixology & DC will post the rest of the old series if those sell well enough up to the cancelation. THEY CANCELED HAWK AND DOVE! WHY!!!?? WHY DC, WHY!? They also canceled Static Shock, which is also as disappointing. I can see why though, the current storyline is confusing and I’m not getting into it no matter how much I like the characters. I was even getting attached to his sisters even though I had no idea what was going on. Honestly, I was hoping for the series to get past this arc and then things would look up, but I guess it won’t get that chance. This entry was posted in Comics, Fangirl, TV and tagged DC Comics, Hawk and Dove, Transfomers Prime, Transformers on January 14, 2012 by Liliy.